The most secluded accommodation on the Wildside holiday park, Otter lodge has one bedroom and is situated on the river’s edge. It has full gas fired central heating which you control. This lodge is ideal for a romantic getaway, honeymoon or special occasion. The spacious pine lounge/dining room has a lofted ceiling with pine beams and a wood fire. A full length picture window looks straight onto the picturesque river. The lounge has a comfortable leather sofa and chairs, colour TV with radio and DVD Player, a selection of books and games and a local tourist information pack. Off the lounge a modern cream shaker style kitchen, equipped with electric cooker and microwave oven and a fridge with freezer compartment. The kitchen cupboards are well stocked with Churchill crockery, non-stick pans and a full range of cutlery, glassware and cooking equipment, you will find everything you need for a self-catering holiday in this delightful kitchen. The very large master bedroom also has a full length picture window looking onto the river, a comfortable king size bed with deluxe mattress, warm hollow fibre duvet and pillows and fresh linen. Two double wardrobes with two chest of drawers and a dressing table makes this a tranquil and cosy haven. The bedroom has access to the new luxury shower room. The newly fitted luxury bathroom has a large powerful walk in shower with luxury bathroom fittings. Towels, bathrobes, slippers and bathmats are provided. Otter lodge is south facing. 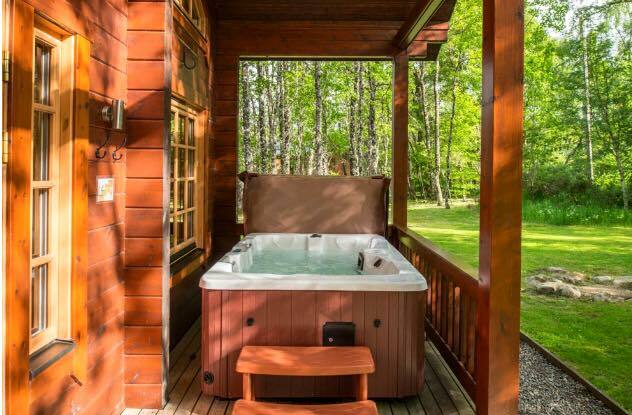 An elevated covered veranda is provided with hot tub and decking from which to admire this secluded section of the river. Flood lights over the river provide a delightful backdrop for evening use. The bird table plays host to a variety of birds from Woodpeckers to Bullfinches and many more. With delightful views over the river to the mountains these cosy lodges are ideal a romantic retreat. A barbecue with charcoal is available for your use. Car parking is adjacent to the lodge. With delightful views over the river to the mountains this cosy lodge is an ideal romantic retreat.